Want to immerse yourself into a great war game on your Android or iOS device? 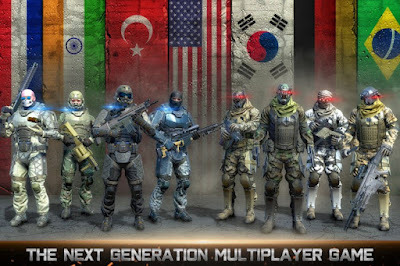 To become the leader commando of your own army and conquer the whole world? Welcome to Country War, one of the greatest modern warfare games we've played in a while! With epic battles, awesome action features and intuitive controls, this game is our choice for an Action Game of the Week. See why below! If you want to engage yourself in endless World War battles and enjoy a FPS action adventure, Country War is the perfect game for you. All you have to do is plan your attacks, show your war skills and destroy your enemies to win the world. Country War is a strategy shooting game that shines with great HD graphics, awesome sound effects and neat touch screen controls. Keep reading and find out how to play. Country War has a challenging gameplay where you are the leader Commando with tons of missions ahead. The main goal is to fight against enemies and win the whole world. Just choose a country to play with, team up with the best shooting squad and plan your attacks. You will have to think strategically, use the most powerful weapons and earn higher scores. There are multiple game modes to play, such as Bomb Mode, Capture the Flag and many more, different awesome weapons (sniper rifles, shotguns, machine guns, pistols, etc. ), a PvP multiplayer mode where you can compete against other worldwide players, customizable options that make your gameplay even better, on-screen neat controls, and so on. Think of the best war strategies in order to conquer countries and to be on the top of the game’s online leaderboard. You can play it even if you’re not connected to the Internet because it supports an offline mode. Download it today for free from Google Play and enjoy hours of action fun!